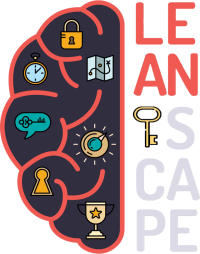 Leanscape for Project Management consist of another eight rooms and eight different topics. The training explores the daily work of a project manager while spreading a deeper understanding of agile and lean values and actions. The first four rooms include general project management exercises and tips whereas the later four rooms focus solely on agile and lean projects. How to plan and manage a Lean project? What are the 5S? How to manage the problem solving situations? How to use Lean tools such as Kanban and A3? An introduction to Lean Six Sigma. How can a project utilize Lean and Six Sigma to tackle their problems and reach perfection? Each of the phases of the DMAIC will be discussed and practiced with multiple tools.